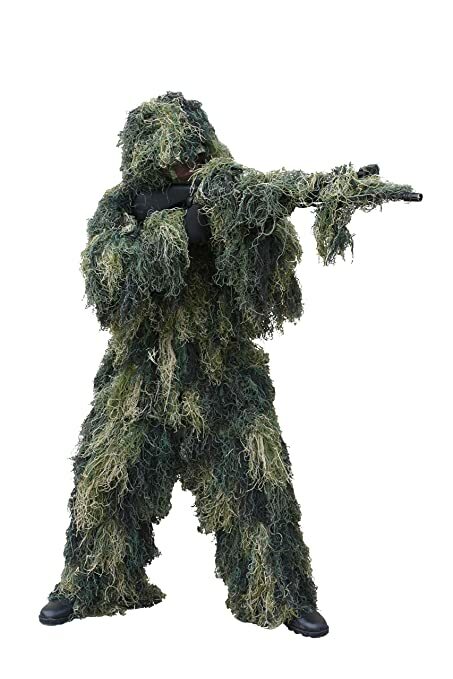 The Red Rock Gear Woodland Camouflage 3 Dimensional Ghillie Suit is an awesome adjustable 3D Ghillie Suit that can make you practically invisible in the brush or patch of grass or weeds. Available colors include woodland camouflage, desert camouflage, snow camouflage, and ACU camouflage. Staying hidden greatly increases you chances of success in hunting, and also if you need to hide in a Doomsday survival scenario. The 5 Piece Ghillie Suit includes a hood, jacket, pants, gun wrap, and a stuff sack. Other colors available include desert camouflage, snow camouflage, and ACU camouflage. This suit is lightweight and breathable and is made of 98% polyester and 2% spandex. The jacket has a snap closure front and an elastic waist band making it suitable for layering your clothing. The pants are drawstring and elastic in the waist offering a wide range of comfort and sizing. The pants also include snap closures on the outer seam of the pant near the ankle to cover boots easily. The hood covers the entire head and neck. It is also adjustable with a drawstring chin strap. The gun wrap has elastic and a drawstring which allows it to cover an average size shotgun or rifle. The entire Red Rock Gear Woodland Camouflage 3 Dimensional Ghillie Suit fits into the included stuff sack. There are Youth sizes of this Ghille Suit (link below). This Ghillie Suit does not come with gloves. It is recommended that you purchase some camo gloves, and also consider buying a camo head net or hunter's makeup to complete your camouflage attire. See the recommended accessories below. Always move slowly and quietly. Take advantage of and move when there is noise such as the wind making sound. Stay low and in shadows avoiding direct sunlight when possible. Move under cover (behind walls, through brush, tall grass, etc.) whenever possible. Glance at the ground and plan your footing as you walk to avoid sticks, etc. Roll your feet from heel to toe along the edge of your foot slowly to totally eliminate distinguishable foot steps. Always remain tight to the nearest object you are by (trees, fence, bushes, etc) as you move. Creep along slowly taking a moment to pause every 20 feet or so. Focus on one spot in the distance & stare. Your eyes are very good at identifying movement & superb at it when they are also not moving. When you are not moving periodically close your eyes & listen. If you are trying to hide or evade enemies, become skilled in observing wildlife. Birds in one direction is a good clue that you will not find enemy contact in that immediate direction. The position of a startled flock of birds should be avoided / observed. "Hide in plain sight. Great for coyote hunting & photographers." "Suit was great out of the box. Fit was appropriate and will no doubt be a great addition to my hunting apparel." "Can't beat the value of this Ghillie Suit. I saw these Red Rock Outdoor Gear ghillie suits at Christmas in Scheels and thought about buying one but I had gone there for other gifts. I finally bought one for myself and now I don't go to the ranch without it. Sometimes I use, sometimes not, but it's a blast when I call up those pesky coyotes. I think I'm going to buy the desert now cause it get so dry out there." "For the price you are getting a good product. You need to open it up and let it breath to get a good look. I am 5'8" 185 lbs and it fits good. Stop wasting time trying to save $5 somewhere else and just buy the suit already." "I had been told that this suit would make bow hunting a bit easier due to the figure that deer see is not the normal "human" outline - and this suit proved their point. It gives me a better chance to see more wildlife." "I just got my ghillie suit, and I give it a 5 star, be aware that there are holes in it, but if you look closly at the picture it does show gaps. The camo works great!" "Nice suit. It is what they say it is. Easy on and off,all you need to do is give it a good shake to get it to fall the right way.The only thing is I don't use the hat." "Best for money. It is pretty sturdy, the gun wrap is very meh, i found that the fabric is very see-through, and use the hat backwards because the large black square is very visible." "Definitely Right Shark. I saw that there are lots of reviews saying that there were holes in the suit and it didn't really work well. I'm here to tell you that all of that is BS. upon receiving your ghillie suit, you need to untangle and separate the individual threads to give it more volume. to make it easy, start from the bottom and work your way up and I promise you that it will look great.